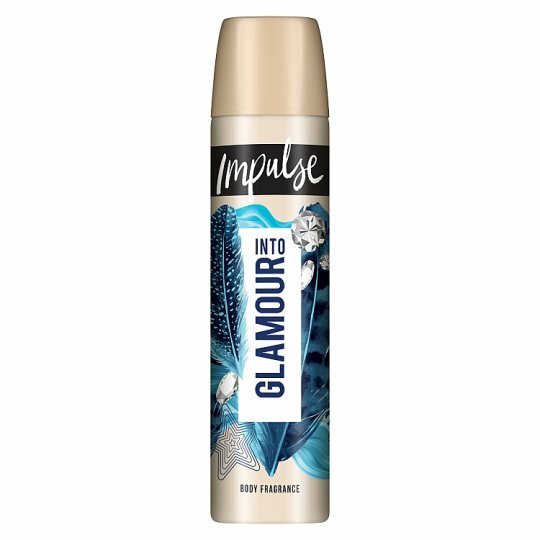 Impulse Into Glamour Body Spray deodorant 75ml is part of Impulse’s body spray range featuring a variety of exciting and fresh fragrances to suit your every impulse. This perfect 75ml size means it easily fits in your backpack and can be enjoyed at school, after the gym or just on the go. Enjoy this fragrance anytime, anywhere and Trust Your Impulse. Into Glamour A bright and sparkling opening of tangerine and pink pepper, surrounded by the cool and crispy notes of the guavatini accord, gives room to an opulent body, full of floral reminiscences of violet, lily and the everlasting magnolia and rose. Sweet notes of vanilla and ambery nuances combined with the glimmering shades of sandalwood provide an indulgent oriental finale. Impulse Into Glamour infuses a sparkling floral fragrance with opulent oriental notes to leave you enveloped in a subtle exotic scent.